The Lay Z Spa Palm Springs sits in the middle of the pack when it comes to size, allowing just the right amount of room for the average sized family, or group of friends. The impressive exterior design that this range is known for is still present with this model and so is the exceptional build quality. Click here for more information and to buy on Amazon.co.uk. 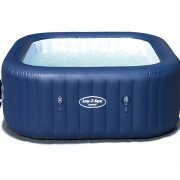 The Lay-Z-Spa Palm Springs is one of the larger inflatable hot tubs in this range. The added bonus of this particular model is the increased water capacity on offer, giving you all the more room to float around and enjoy the whole experience. 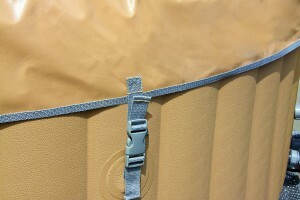 The manufacturer, Bestway, states that the tub will fit 4-6 people comfortably but we found that it is best to stick to the lower end of this estimate, if you want to avoid any uncomfortable skin-on-skin contact. One feature of the Lay-Z-Spa Palm Springs that really sets it apart from the other inflatable hot tubs on offer is the addition of a cushioned bottom to rest your weary feet on, at the end of a long day. This, we found, greatly improved the comfort level of the tub and made sitting around and enjoying the luxurious water jets so much more enjoyable. Furthermore, this cushion is kind to both your body and your wallet, as it reduces the amount of heat lost through the base of the tub. It is recommended to heat the Lay-Z-Spa Palm Springs all the way up to its highest setting of 40 degrees celsius, which is considered to be the most comfortable temperature. Like other models, although depending upon outdoor conditions, it can take up to 14 hours to achieve this temperature. 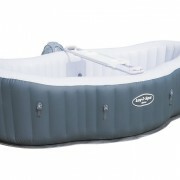 The important thing to remember is that with the inflatable lid and the previously mentioned cushioned bottom, once your optimum temperature has been reached, it can maintain this temperature for much longer than traditional inflatable hot tubs, meaning that you get more time to soak. We recommend that you set the tub to heat itself over night if you fancy a morning dip, which is a great way to set yourself up for a busy and possibly stressful day. 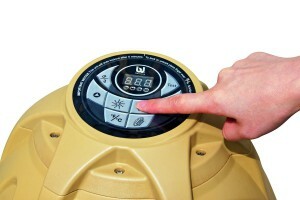 The Lay-Z-Spa Palm Springs could not be easier to set up, requiring the user to simply inflate, fill with water and heat up. There is an incrediby useful DVD included in every box that contains clear and concise intructional videos that explain how to get the tub up and running. However, most users won’t even have to use this DVD because the whole process is very simple, requiring no previous technical experience or special tools of any kind. Firstly, you need to find a flat and level surface that is big enough to accomodate the size of the tub. The tub itself doesn’t require any plumbing, all you need to do is plug it into a standard wall socket to inflate and then add water using a garden hose. One you are up and running, the spa has a handy digital control panel that allows you to easily set and adjust the temperate of the water. Due to the fact that the spa is so easy to set up, it can be easily transported, giving you endless ways to enjoy your tub while you are away on holiday, at a friends house for a party, or any other place where you may want to set up shop for a few days. 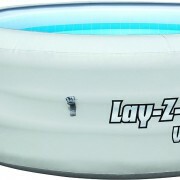 The lay-Z-Spa Palm Springs comes with an inflatable lid, which not only helps to prevent heat loss, it also stops unwanted debris from falling into the water. Furthermore, it also acts as a way to prevent small children and pets from gaining access to the water, which can lead to very dangerous circumstances and is a real concern for parents. Although this added protection does help ease the minds of parents, it should never be used as a replacement for proper adult supervision around the hot tub. 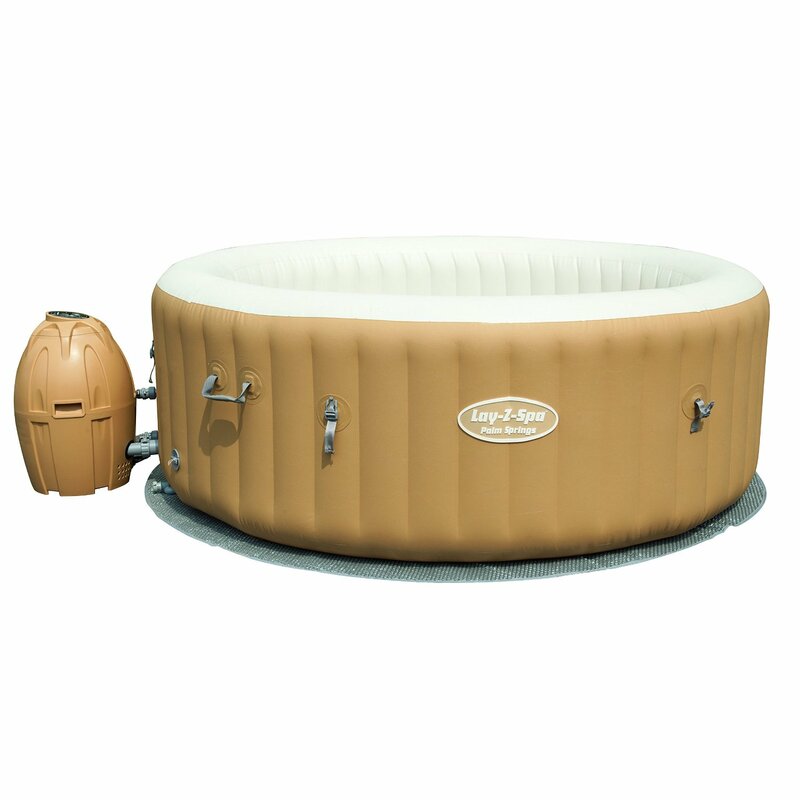 Unlike other inflatable tubs in this price range, the Palm Springs comes with a leatheroid and puncture resistant outer shell. This, we have found, is very strong and makes puncturing a near impossibility. However, in the unlikely event that you do spring a leak, there is a puncture repair kit included with every purchase. Another unique feature of this tub are it’s strong and sturdy outer walls, made of a special I-Beam construction. All you need to know about this is that you can perch yourself on the edge of the tub without fear or slipping off the side or causing an embaressing cave-in, which is the last thing you want your guests to experience as they try to relax! It also allows you to take a break from the warm water by sitting on the outer wall, with your feet submerged, instead of having to leave the tub entirely. 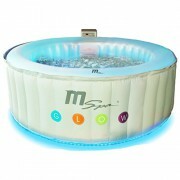 The Lay-Z-Spa Palm Springs is one of the most impressive tubs we have ever reviewed. With its bonus features and its high-end appearance, this tub gives you a taste of luxury in your own home. 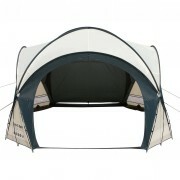 The added water depth and durable exterior make it perfect for those with large familes and especially, young children.